I was excited last week to see LinkedIn presenting a series with professionals sharing stories about what they wish they knew at 22 so I joined in on the fun. 11 years today, I graduated from college and I’d just turned 22 years old a month or so prior to crossing the stage. #IfIWere22, I’d give myself these 22 wise pieces of advice. Entrepreneurship can put you in a personal deficit. You often give more than you get. Do not forget to take care of yourself. A relationship/marriage is a partnership. Choose a man who is loyal, spiritually grounded and focused on building a future that includes you. Passion leads to purpose. What you are passionate about today can change tomorrow. Search for your God-given purpose instead. Wake up early enough to pray, meditate and have some quiet thinking time before the day gets started. The countless happy hours, late nights and industry parties can add bags to your eyes and pounds to your thighs. Be easy. There will be many things in the world that will make you sad, angry and confused. Instead of letting them discourage you, find the courage to advocate for them. Not everything needs to be announced. Thanks, social media. Let folks see what you did, not what you’re doing. The right people and right situations always occur in your life at the right time. Respect and cherish them. Don’t force anything, chase anyone or mourn over lost time or missed opportunities. Whoever/whatever is meant to be, will be. Write yourself a reality check, boo – money does not grow on trees! Appreciate what you have. Eat at home. Shop less. Save something. Make a budget and stick to it. You are enough. You don’t need anyone to co-sign for you. Careful welcoming people into your space who make you question yourself or second-guess your ability. Many people will come into your life, push their own insecurities onto you, then walk away leaving you to heal in places where you were never broken. Make a to-do list everyday. Cross off as much as you can by the end of the day. If anything is left, no worries. Put it on tomorrow’s list. Those quirky things about you are totally fine. You’re weird sometimes and that’s okay. Women sometimes get the short end of the stick, especially black women. Don’t let that fact hinder your progress. No matter how sweet or humble or smart you are, people will be intimidated by your strength and your confidence. That’s not your fault. They’ll just have to get over it. Do you. Time is money. You’re either moving toward making it or getting closer to losing it. Period. A failure is often a set-up for a win. You will drop the ball sometimes and that’s okay. Pick it up and keep it moving. Your “hustle” or your “grind” is not badge of honor. In fact, it can be your own worst enemy. Focus on the quality of the outcomes instead of the amount of hours you clocked. Your success is not on deadline. You shouldn’t always be the smartest person at the table. You should have people around who are sharper than you. Keep them close and let them rub off. Iron sharpens iron. Your network is your net worth. Forget about work-life balance. You’ll never master it. Attempt to achieve balance from within. You are not a slave your phone or email. Stop sending and responding to work messages or calls past bedtime. The perception conveys that you have no boundaries and no life. Refresh, power off, unplug. Chill. God is in control and life is good so enjoy it. Photo: College graduation day, May 2004, Age 22. 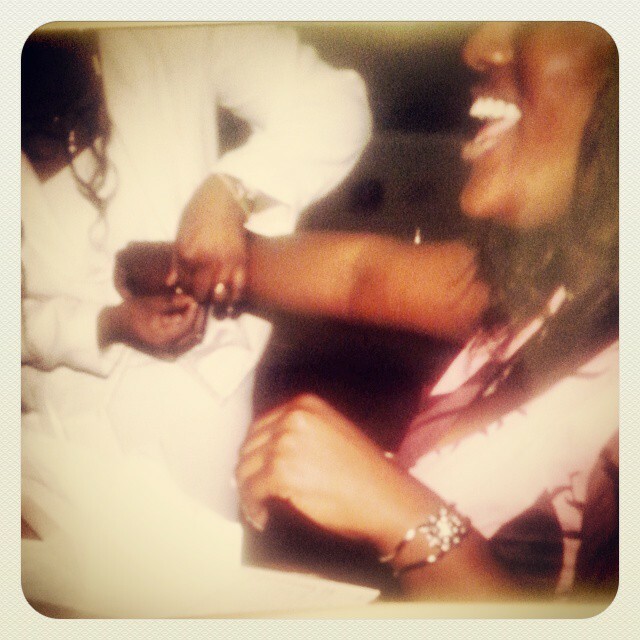 My mom giving me a diamond tennis bracelet as a graduation gift. I sold it a month later to invest in the launch my first company. #IfIWere22 today, I would probably do it again. 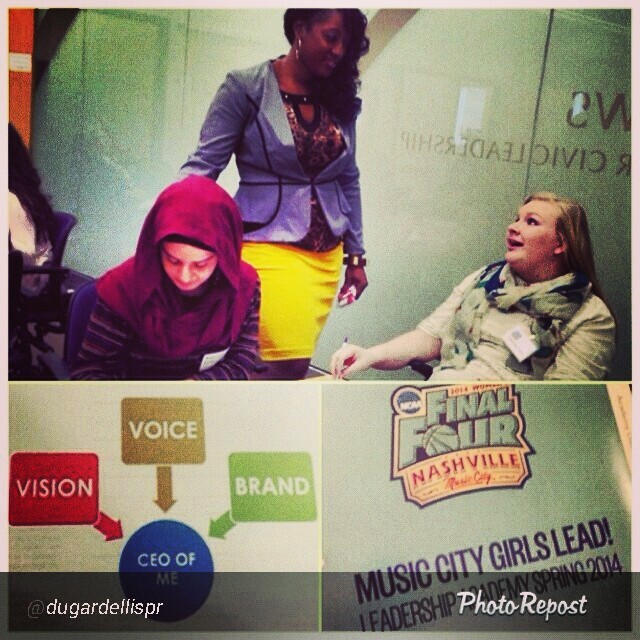 “Vision + Voice + Brand = CEO of Me” is the title of the workshop I had the honor of facilitating for Music City Girls Lead! 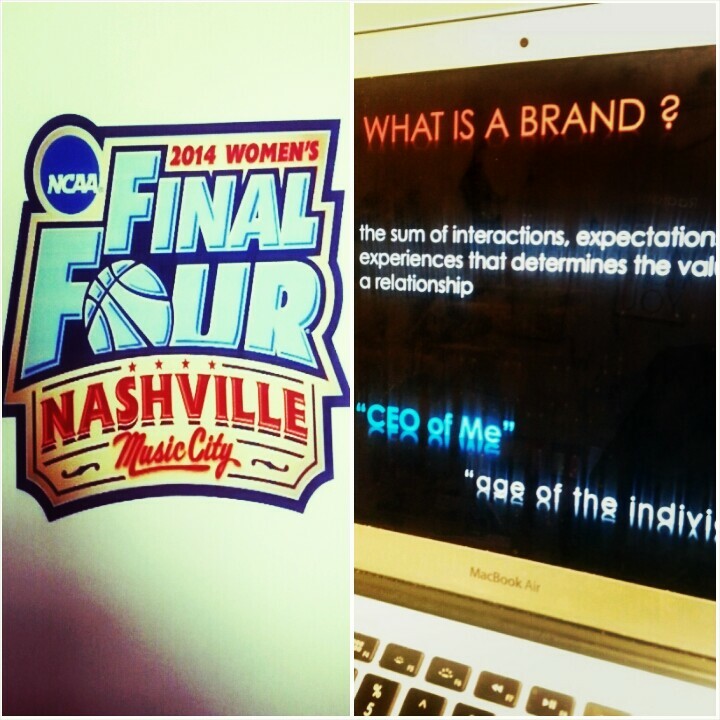 – a leadership academy produced by Lipscomb University in cooperation with the Champions4Women Committee of the Nashville Local Organizing Committee, proud host of the 2014 NCAA Women’s Final Four. The Academy was a series of classes and experiences for high school girls in grades 9, 10, and 11 in the Middle Tennessee area aimed at strengthening girls in their pursuit of excellence through classroom and online learning, community experience and direct mentoring. Engaging the students were a few of Nashville’s deep bench of local leaders and mentors, as well as experts on leadership development. The Academy curriculum covered six different areas: developing as a leader, becoming an ethical leader in multicultural society, developing vision and voice, learning to use technology in leadership roles, promoting wellness and health, and transforming vision into results. Each academy culminated with a graduation ceremony and served as a lasting legacy of the 2014 NCAA Women’s Final Four. We talked about female visionaries such as Michelle Obama and Taylor Swift. We also looked at young girls who had the vision to become successful entrepreneurs at an early age. Next, we defined voice. Your voice is inherent to who you are. You have to find it. We did an exercise that allows the girls see the various ways we can find out voice through writing daily. That allows your content to be your voice and for your story to inspire someone. It proves that what you have to say has value. Then we defined a brand. I explained they each have their own brand and that it will always follow you throughout life. When you hold true to your brand personality, opportunities come to you. We did an exercise that allowed the girls to write their favorite brand on a name tag and introduce themselves to the group as that brand as a parallel to who they are personally. We then discussed online protection and privacy, the best tools to use for distributing your voice across social media and how to find your passion through these activities. I also gave the girls a worksheet as brand map to take home and chart their future success. This was a great opportunity to teach and inspire. Girls rock! That’s right, we said it! 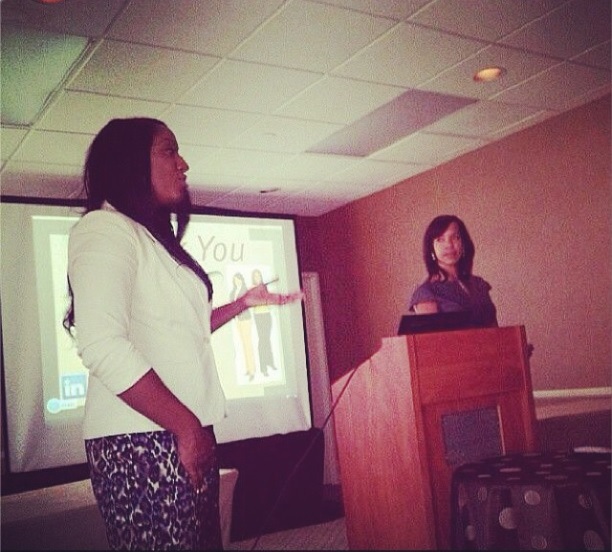 Perri and I presented a workshop at the 3rd annual WOMEN IN PR Summit, a conference designed to empower, educate and encourage women in the public relations industry September 26-29, 2013, in Houston, TX at the Doubletree Galleria Hotel. There were nearly 100 women in attendance over the weekend. We were so pleased to share our knowledge with young women who are aspiring or making entry into the PR industry. Artist Publicity: Is Your Music Ready for Media? Public relations, music, non-profits, and my hometown Memphis are few of my favorite things. So I was excited to get an invite from Cameron Mann of the Memphis Music Foundation to facilitate a workshop on PR for local artists and industry insiders. Most times, artists aren’t sure how to approach PR from a strategy or representation standpoint. When should they implement a PR strategy? Who should they get to do it? How even? With Memphis being such a great breeding ground for new artists, it created a perfect opportunity for the foundation to provide resources for those interested in the music industry from all aspects, especially PR. I headed down to the Bluff City and had a great time giving PR tips to the attendees. Here’s the full presentation via Slideshare. That’s the foundation’s tag and it’s true. You can’t think of Memphis without thinking of music. Building on that legacy, the Memphis Music Foundation has established a resource center as an interactive, living library and workspace that offers a dedicated staff, tools and resources to help area musicians and music professionals be successful in the ever-changing music industry. Visit the foundation’s website for more info. The recent scandal that led U.S. Rep. Chris Lee to his sudden resignation is a tale of online reputation. Here you have a 46-year-old married member of Congress who answered a Craigslist singles ad as a 39-year-old divorced lobbyist. And, for the sake of eye candy, he included a picture of himself standing half-naked in front of a mirror flexing his muscles. Lucky for him, the woman whose ad he answered, was a 34 year-old single mom searching online for a date who decided to check his story on Facebook. Once she realized he was a married politician, she forwarded his goodies to gossip site Gawker and the exposure set his resignation in motion. For the record, a public figure (or anyone really) should beware sharing anything online that is meant to be a private matter. Some say the single woman is the bad guy for sending the shirtless pics of the Craigslist Congressman and sharing her flirtatious convo with Gawker – Lee had never even met or been involved with her. I say – when you play with fire online, you might get burned in public. This leading lady of personal branding practices what she preaches. 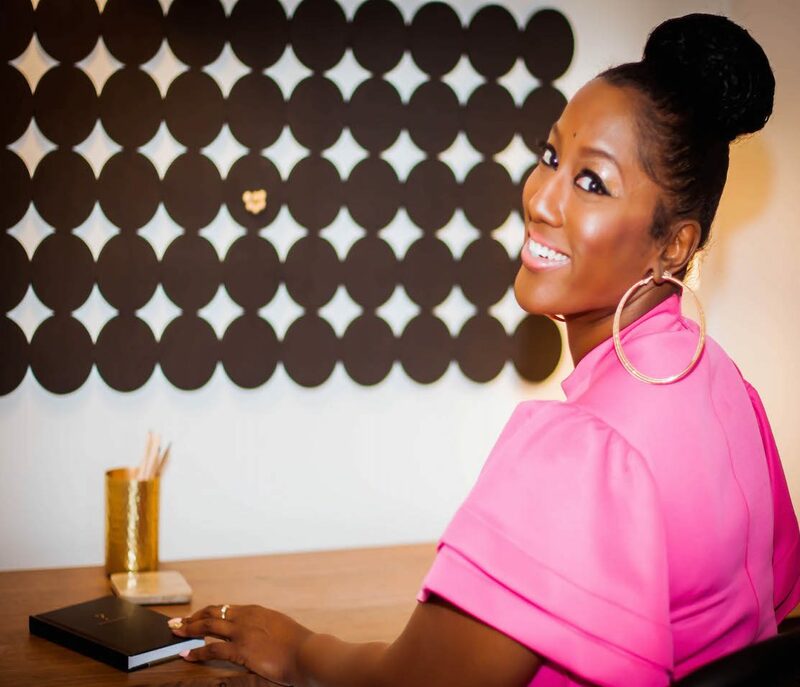 From her Sunday morning motivational segment on CNN to her weekly vlog, “Brand Me Minute,” featured on Essence.com, Melissa Dawn Johnson works to empower individuals by reinforcing the idea that change is a catalyst to unleash potential. As CEO and president of Velvet Suite Marketing Consulting Group, Inc. and Brand Me International, she has developed powerful branding models for celebs, athletes and corporations. What is most intriguing about Melissa is her ability to transcend her own personal brand into a national movement of personal discovery for millions of others to find their true passion and live in it! Learn more below by joining the “brandtastic” movement on Facebook. Here’s a woman who has mastered many facets of entertainment – music, television, film, theatre, books, beauty and business. Her recent CNN appearance on Larry King Live reveals the honest way in which she approaches her personal brand and how she doesn’t allow prying into her private space. Who needs the dish on the Queen when the success of her career is enough to keep us talking for decades to come! Hear her philosophy on how she manages a personal brand while protecting her personal life. Okay, okay – I know what you’re saying, “You like her because she’s a Spice Girl.” Actually no. I respect this former girl group singer because she has seamlessly transformed her posh personal brand into fashion icon status. She took her stage presence to the runway and finally landed in the designer’s chair to launch her own collection of dresses that celebs and even PR strutters like me are going crazy for. Check out a recent rundown of which celebs, including Sarah Jessica Parker and Jennifer Lopez who both wore a piece from the collection to the White House, are making Victoria’s collection a staple in their red carpet wardrobe.